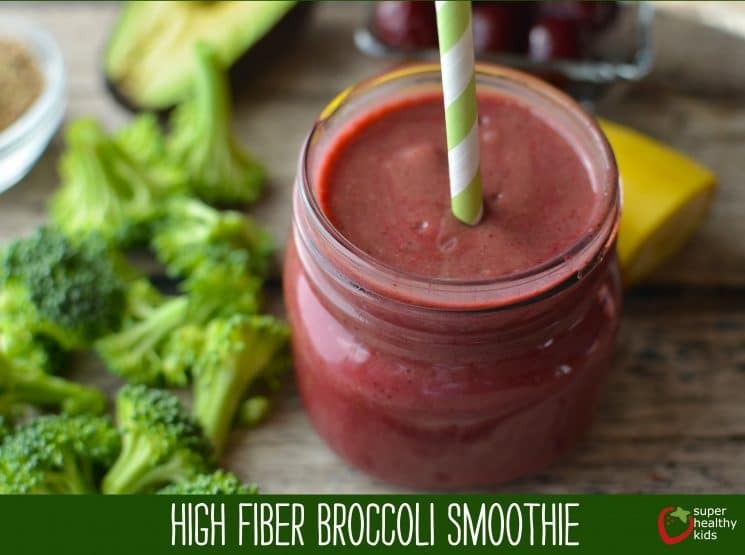 This High Fiber Broccoli Smoothie Recipe is an easy way to add more fiber to your kids diet! Some days it’s hard to get much fiber into the kids. This can definitely be a problem, as fiber is essential for good digestion. Kids fiber needs vary from kid to kid, but a good rule of thumb is 5+ their age. So, if I have a 5 year old, 10 grams of fiber per day is a good guideline. Fiber slows digestion so the glucose can enter the bloodstream more slowly; helps to control blood sugars. Helps prevent overeating because you feel full and helps maintain a healthy weight. Dietary fiber includes all parts of plant foods that your body can’t digest or absorb. 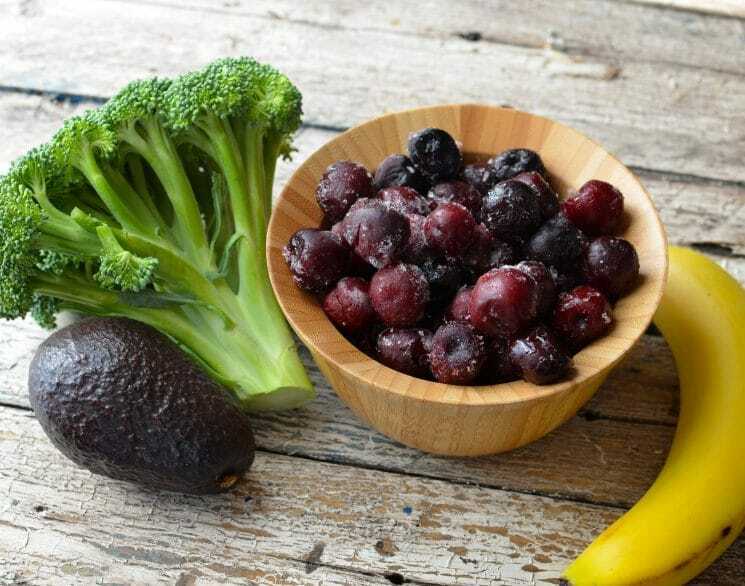 Unlike other food components, such as fats, proteins or carbohydrates — which your body breaks down and absorbs — fiber isn’t digested by your body. Instead, it passes relatively intact through your digestive track. So, we put all these fiber rich foods into a smoothie! If you haven’t used broccoli in a smoothie before, you really can’t taste it with the flavors of the fruit. It is however helpful to have a really good blender so you don’t have broccoli florets, or chunks that won’t fit through your straw. 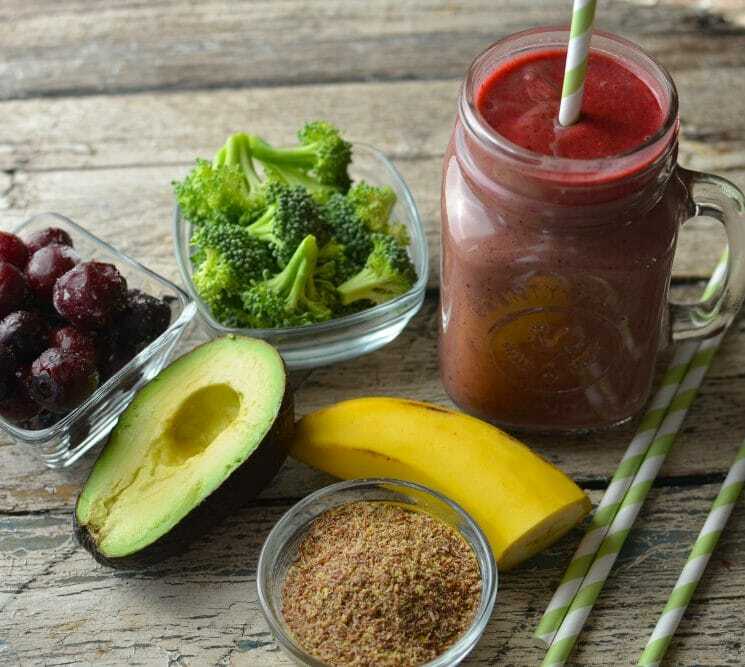 Give this smoothie a try! Let us know what your kids think! Blend all ingredients in a high powered blender and drink! 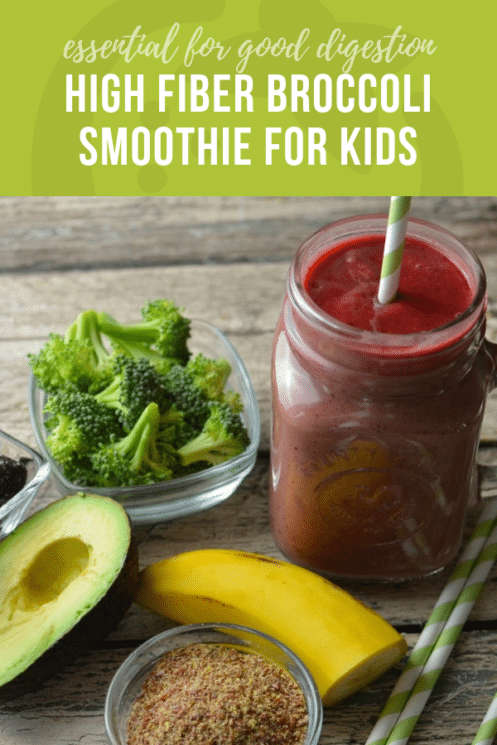 I just made this smoothie for my kids. It came out a little more brown than in the photo and thick but they seemed to like the flavor and they drank some. I am putting the rest in the fridge and will see if they will have more for a snack tomorrow. I haven’t ever tried broccoli in a smoothie before. My older kids love it, but this might be a good way to get my picky 3 year old to eat it. I have a good ninja blender but the smoothie was chunky and not at all like the picture. 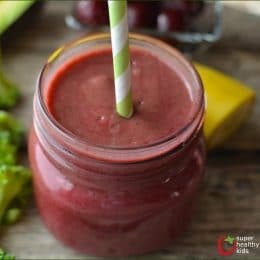 Broccoli in smoothie ? Never tried. I’ll try it tomorrow. we have tried this twice. first time was like a brown thickshake. second time I put in extra cherries and a cup of ice. Consistency like pouring yoghurt and was definitely purple! next time will try with a few more cherries and a splash more juice. YUM! Do I steam the broccoli first? We used raw broccoli Sara. I tried this but replaced the flax with chia, replaced the cherries with a whole apple (sans seeds), and replaced the juice with flavored water. Also used frozen organic broccoli. The avocado was also frozen (processed by me and frozen a few months ago). I put the frozen items right in the Blendtec. You can’t taste the veggies at all. Turned out great, if you don’t have any aversion to apples or bananas. It was a hit with one out of two kids, but only the one had wanted a smoothie at the time. With other replacements I’m sure she’d love it. Both are picky eaters. Won’t you cook the broccoli first before blending? I want to try it. We used it raw and it blended well. If your blender isn’t very powerful, perhaps softening the broccoli first is a good idea! Are these measurements suitable for Adult fiber needs as well? I was pleasantly surprised. I expected to taste broccoli but you really can’t. And it was filling. This sounds great. Looking forward to trying it. Will excess stay good in the refrigerator for a day or two? Or do you recommend making a smaller batch if it won’t all be consumed right away? Personally I like smoothies fresh so I would make a smaller batch. Good luck!